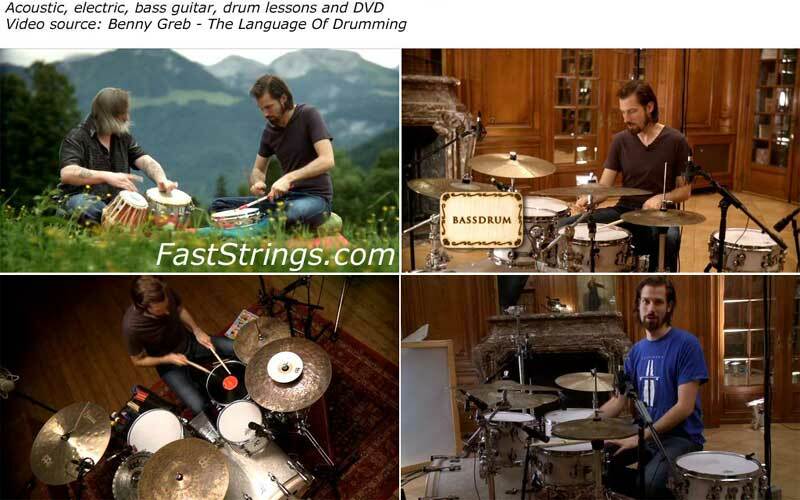 The Language Of Drumming is a game-changing addition to drum education that contains the method created and used by internationally-acclaimed drummer Benny Greb to develop his awe-inspiring creativity, musicality and technique. For any drummer that aspires be a better player and a more complete musician, he’s definitely speaking your language. From the overture and opening credits to the movie-within-a-movie menu, viewers of The Language Of Drumming (Hudson Music) will immediately sense that even though they’re watching a drumming DVD they may well be seeing the beginning of a new era in music education. Beyond its amazingly clever concepts, beautiful sets and Academy-award worthy production values, this groundbreaking two-disc set also presents extraordinary European drummer Benny Greb and his advanced approach to making music that raises the art of drumming to an entirely new level. As Greb explains in his initial on-camera comments, learning to play the drums is like learning to speak a language. Greb makes the point that knowing a few basic drum beats and fills is like knowing only a few standard phrases in a language; they won’t allow you to communicate clearly or have a full, interactive conversation in practical situations. Greb’s carefully thought-through solution- and a quantum leap in drum education- is to learn the “language of drumming” by starting with its smallest components: the individual “letters” of the rhythmic alphabet. Greb then introduces his revolutionary 24-character system and shows how to use the basic binary and ternary rhythms to develop timing, technique, dynamic control and speed… even the traditional drum rudiments. Covering hands and feet, with and without a practice pad, he quickly progresses from simple alphabetical exercises to more intricate examples of “words” (rhythmic phrases) and “syntax” (sentences and vocabulary) on the full drumset. The second disc goes on to include a vast amount of additional information, from practical discussions about the importance of listening, building fills and solos using improvisational exercises, and developing better time and expanding rhythmic “comfort zones” through creative use of a metronome to ingenious examples of finding new and alternative sounds on the drums. Throughout the entire presentation, Greb flawlessly performs exercises and patterns that illustrate his theories while referring to the comprehensive archive of printable PDF charts and exercises that are included on the discs. The double-DVD also features several drum solos as well as Greb’s performances with master percussionist Pete Lockett and the Benny Greb Brass Band plus a wealth of bonus material and is recommended for all drummers (from beginners to professionals) and drum teachers. must I be premium user to download this? thx! Awesome DVD! Even if you haven’t got the patience to work thru his vocabulary method, the playing & concepts on featured will inspire you for years to come! …just check out Benny having breakfast! Thanks for the dvd, great work!! thanks you very very much, I like Benny Greb. Probably the best drum educational video on the market today. Hi! Links Off-line… can U reload please? Thanks! thx this is a great dvd!!! Make sure to look for the pdf on the internet, there’s all notation. Big thanks from Hungary! I’m a guitar player but this course helped me a lot understanding rhytm playing. Does someone know what kind of programm should I use to join these parts? Thanks, everyone! Very good , Benny is fantastic. i’m only doing it because there’s no people selling this dvd here in brazil. i’d like to honor him buying his work but i unfortunately haven’t got any other choice. I like Benny Greb ,this is my favority drummer workshop. Benny´s drummer language is fantastic. Thanks for post this amazing job.